Well it's officially the last day of the year. Can you believe it? With lots of bubbly, fireworks, and maybe even a NYE kiss on the way, there sure is a lot to look forward to in the next 24 hours. Not least of which...a whole New Year! 1. Brides: Resolve to... think about the wedding day as a community celebration of your relationship; it's not just YOUR special day. 2. Grooms: Resolve to... be a co-captain on your wedding planning team, not a benchwarmer! 3. Brides: Resolve to... ask for help when you need it. Because wedding planning alone is lonely and stressful, and you should enjoy your time as a bride-to-be. 4. Grooms: Resolve to... take your bride-to-be on fun and romantic date nights to get away from wedding stress every once and a while. 5. Brides: Resolve to... document this special time in your life as much as possible! Take selfies, keep a planning diary, and share planning and DIY dates with your friends. You only are engaged once, so make sure you don't let the time just pass you by! 6. Grooms: Resolve to... surprise your bride with something special on the day of... just to make the big day extra memorable. 7. 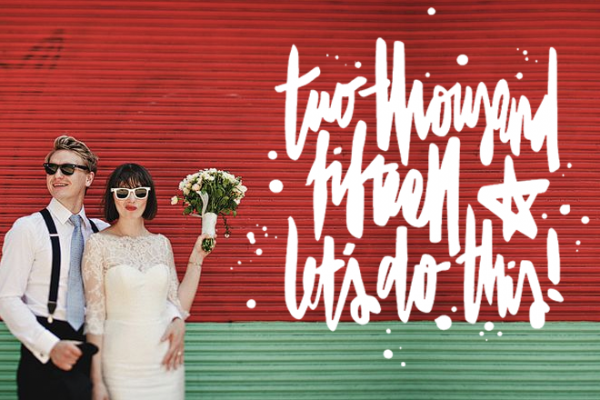 Brides and grooms: Resolve to... commit to an amazing marriage. Because that's what your wedding really is all about! Well brides and grooms? Sound like reasonable resolutions for your upcoming 2015 as an engaged couple, or do you have other resolutions in mind? Let us know what you're planning for your 2015 wedding in the comments!